Last week I received the family group sheet of Henry John Miller and Lavina Johanna Karberg from Tom Townsend, a childhood friend of my mom’s and fellow genealogy researcher. He took me on my trek to Singer Catholic Cemetery. Lavina’s parents were John Karberg and Wilhelmine “Minnie” Bohnsack, a sister of my gg-grandfather Carl Herman Bohnsack. The typed information is from 1983. Henry was born November 10, 1882, in Thompson Twp, Jo Daviess, Illinois. Lavina was born August 21, 1893. They married February 27, 1912, and had six children: Bernice, Earl, Lucille, Pearl, Orville, and LaVern. 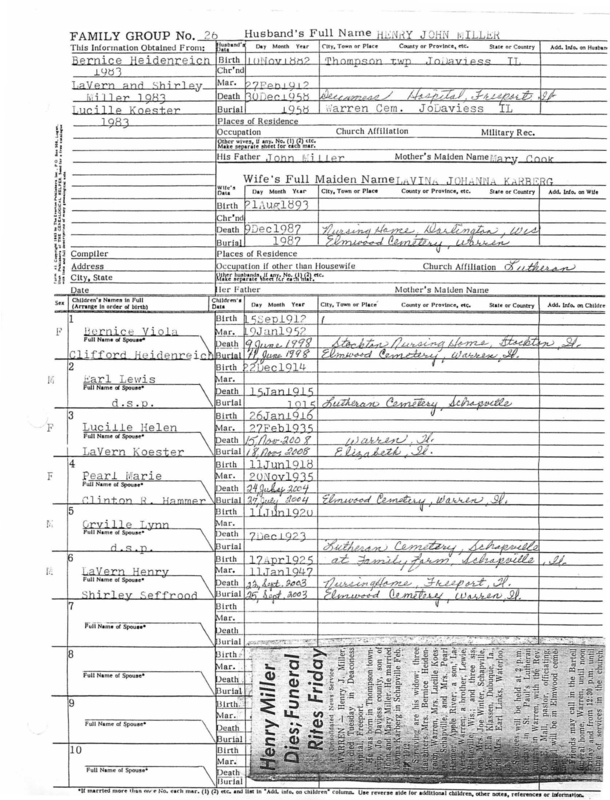 Henry’s obituary is also photocopied on this group sheet. There’s no citation on the obituary.